by Tommy Greenwald. Illustrated by Melissa Mendes. 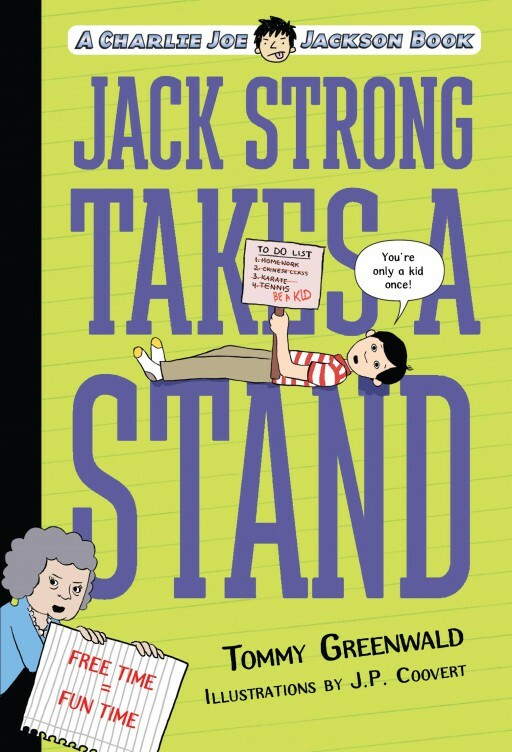 Jack Strong just wants to be a regular kid. But his parents have overscheduled his week with every extracurricular activity under the sun: tennis, baseball, cello, karate, tutoring, and Chinese language lessons–all on top of regular homework. His parents want him to be “well-rounded” and prepared for those crucial college applications. Jack’s just about had enough. And so, he stages a sit-in on his couch and refuses to get up until his parents let him quit some of the extracurriculars. As Jack’s protest gains momentum, he attracts a local television host who is interested in doing a segment about him. Tensions rise as counter-protesters camp out across the street from Jack and his couch. Jack’s enjoying this newfound attention, but he’s worried that this sit-in may have gone too far.